For years my family and I have looked for a larger, more open, affordable home and in December 2011, I am happy to say…We found it! It was PERFECT- 5 bedrooms, handicapped restrooms, HUGE patio doors, large windows and an open floor plan with cabinet tops I could decorate. My dream come true!……..OR not? 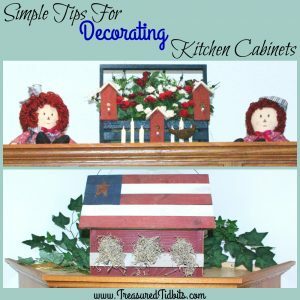 As I began planning the display for Christmas (we moved in on Dec. 16th) I ran into the first dilemma of decorating those recessed cabinet tops. DIRT! The tops were covered with some kind of greasy film (not easily removed), add the fact they were recessed and we have a dilemma. With my physical challenges using a ladder is NEVER a good idea. SO what did we do? Leave them empty? OF COURSE NOT! We got creative and used things we had on hand. We have since used some alternative items but it’s still quite basic and simple to maintain and since we didn’t find much on what to do on the internet we thought we’d share our final solutions with you! How do you clean and maintain an area that is so unreachable? I am sure there are several of you whose response was…. I don’t. No one can see it, so why does it matter? If it doesn’t bother you then you can skip this part, but if it does bother you this part should provide you with some solutions to cutting down on the hard work and time involved in keeping it clean. Having OCD, in addition to 4 cats (now 5), 3 teens and allergies, I am one of those it bothers, A LOT. 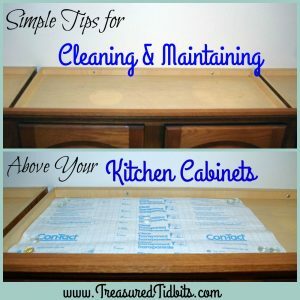 I am not going to sugar coat it the first time you clean above your cabinets will very likely be nasty but once you tackle it and then maintain it you will be amazed at how easy it truly is. We recommend doing this as a team, since your lower cabinets probably extend farther than the upper ones, and you will be leaning, stretching and scrubbing at the same time. 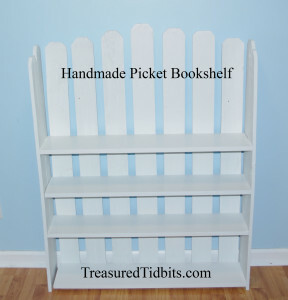 This is the perfect–”You help me with mine and I will help you with yours” project. Not only do you need the 2nd person to stabilize the ladder but they can rinse your rag, answer the door or hand you supplies as needed. (Besides it’s always fun to have good company). After the initial cleaning it becomes MUCH easier to do. I clean mine each time we change holidays or seasons but the initial deep scrubbing isn’t usually necessary. 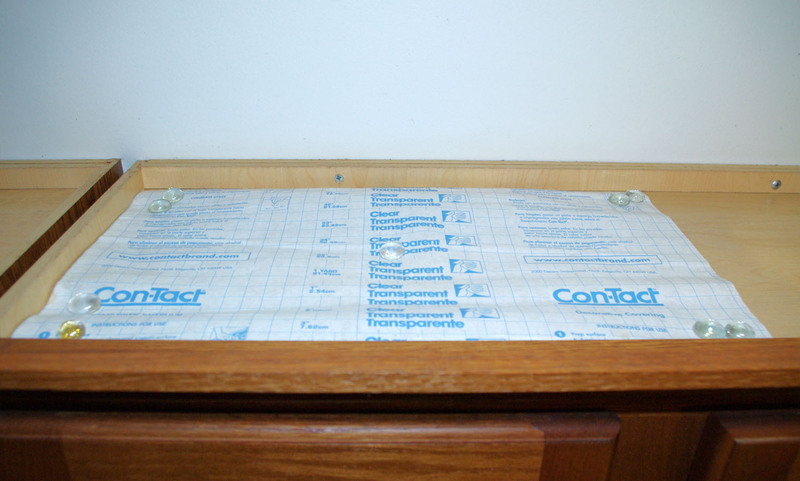 How many of you use shelf liners or contact paper in your cabinets? Who has thought of using them on the TOP of your cabinets? Well, why not? Give it a try. It is SO much easier than scrubbing off the accumulated grease and grime. 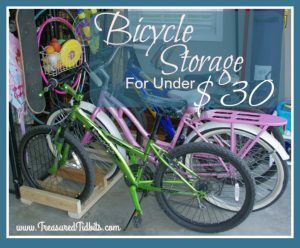 The initial placement will take time a bit of time and cash but… IT is SO worth it! 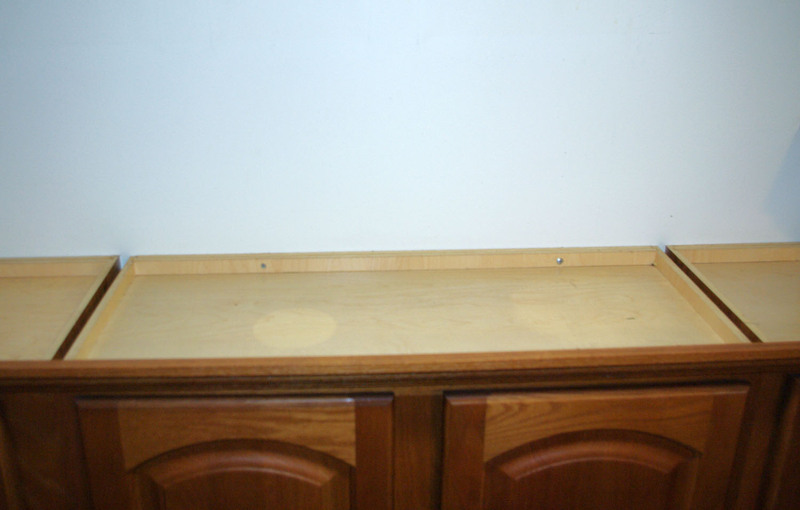 Simply measure each section of the cabinets tops (between supports) and cut the liner or contact paper accordingly. Now, if you use liners with holes in them the grime is going to get through so we recommend SOLID liners OR contact paper. 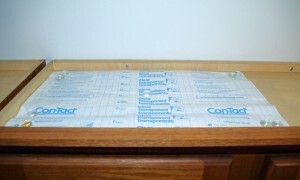 (The contact paper wipes clean and can be pulled up & thrown away if you forget to take care of it for a year or two). 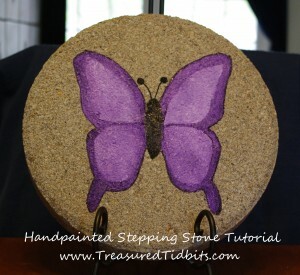 This takes care of the flat tops of your cabinets. What about build up at the pretty lip of the edges? That is what theEXTENDED SWIFFER was created for. 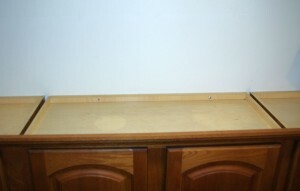 Every time you dust your home, dust the tops of your kitchen cabinets and décor. If you are not tall enough try adding a longer duster or extendable handle to your Swiffer. 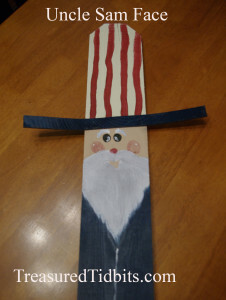 For ideas on how to make reusable Swiffer dusters click here. Click here to see our additional post on tips for decorating your recessed cabinets. 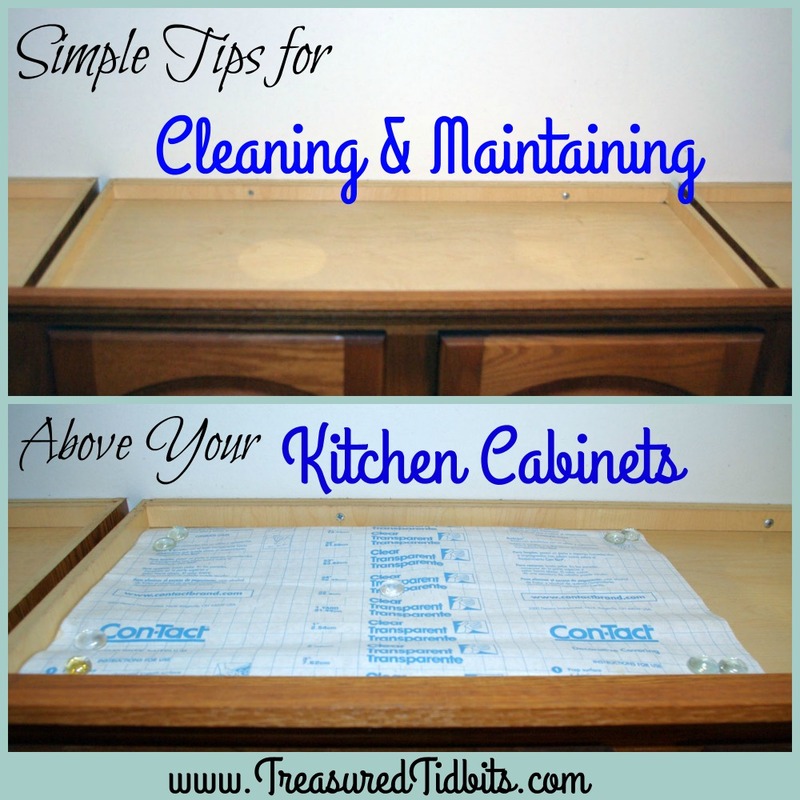 Are you ready to tackle above YOUR cabinets? What are you waiting for? Do it today!!! This post was not sponsored by any brand. It does however contain affiliate links and you can find more on that here. I share these items because I simply enjoy the inventions as they enable me to clean and maintain my home better especially on days when my physical challenges are getting the better of me. If you enjoy what you read today please be encouraged to share it on the social media of your choice, leave a comment below or even drop us an email. For more great home making tips follow us on Pinterest, Facebook, Instagram or sign up for our weekly email.